Ever wish you could experience Shine hands-free, share the 7 Days to Self-Love challenge with your group chat, or listen to Shine anywhere—even when you’re on an airplane? Guess what—now you can. 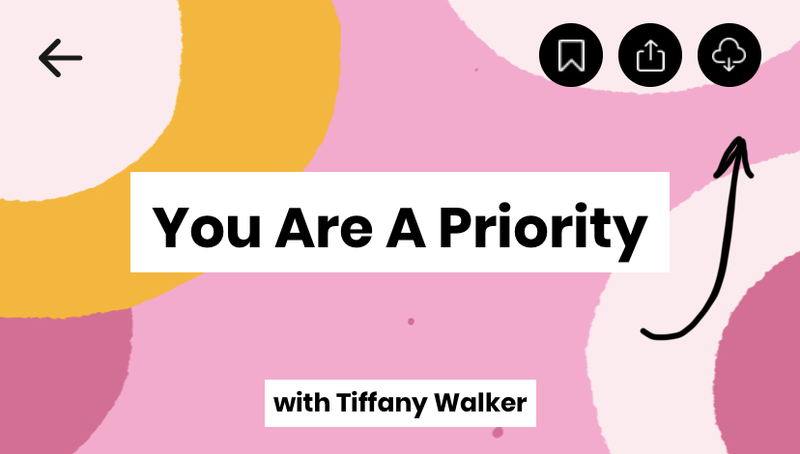 Whether it’s with Siri or offline downloading, there are so many hacks you can uncover in the Shine app to make the most of your self-care practice. 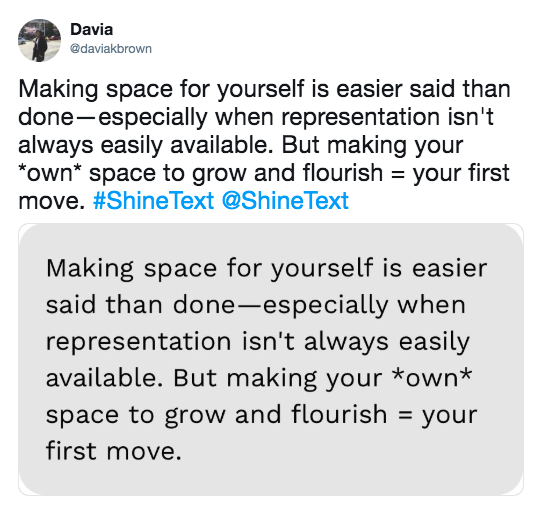 Download the latest version of the Shine app to try out these three ways to interact with Shine. You can now call upon our friend and loyal companion, Siri, to help you tap into your glow whenever you may need it. Whether you’re on the go or getting ready for some you-time, you can now ask Siri to play the day’s Featured Meditation or Quick Hitters. ●︎ Try it out! The next time you’re getting out of bed, just ask Siri to “Play Morning Meditation” to start your day off on the right foot—or ask Siri to “Play Relaxing Meditation” to unwind in the evening. 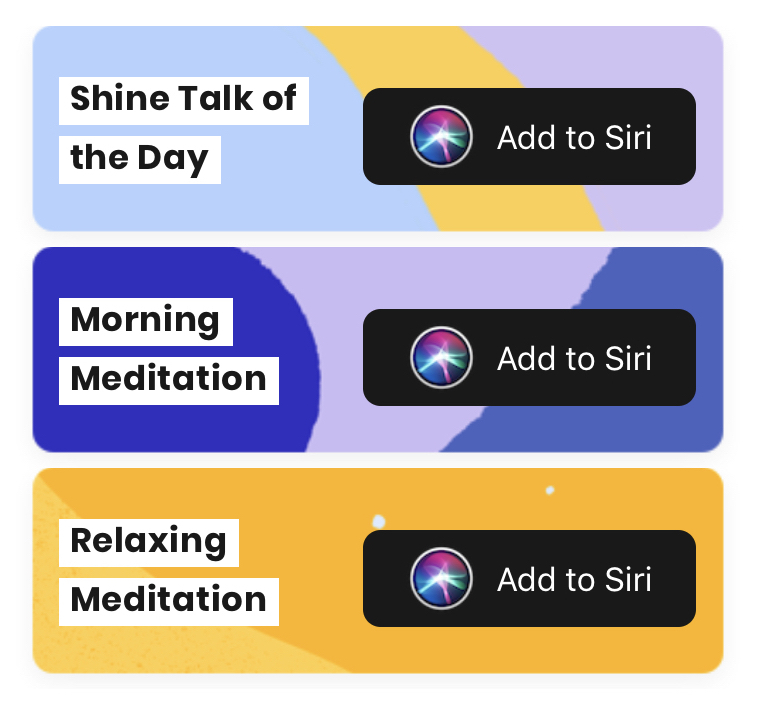 Siri Shortcuts help you make self-care a part of your daily routine by making it easier to access your favorite morning and evening meditations. “Now Shine members can access the app in situations where someone wouldn't have both hands free," Chris says. "For example, when someone is walking or running and wants to easily play their Daily Shine." Plus, if you have Shine Premium, don’t forget to ask Siri to “Play Shine” to listen to a different recommended meditation each day. We’ve all experienced those annoying moments when we’re trying to stream something but limited service in a subway, airplane, or tunnel just doesn’t let us. If that sounds familiar—or even you’re worried about your data plan going over this month—you can download your favorite Shine meditations or challenges to listen on the go. It’s super easy. Open the track you want to download, click the far right icon, and stream anywhere you want. Have you ever seen a tweet or a meme that speaks to you—and immediately shared it with your friends and family? Well, now you can do the same with the Shine texts or meditations that you love. Whether it’s a message that spoke to you, or a track that got you through a hard time, you can share the Shine love with people you love. Try sending a full challenge, a meditation, or your favorite message to someone and make their day. You can even tweet it out! It’s just one way of many to help your squad get through tough times, reflect on their week, or learn something new. To try out these features, today only we’re offering 50% off our Shine Premium subscription, which unlocks all our Shine meditations and challenges for a full year. Head here to claim it.